Clallam County Conservation District: runs a low-cost soil testing program to help Clallam County residents make informed decisions about the management of soil nutrients. Soil tests should be taken in the spring or fall for established sites and at any time of year for new seedings and plantings. 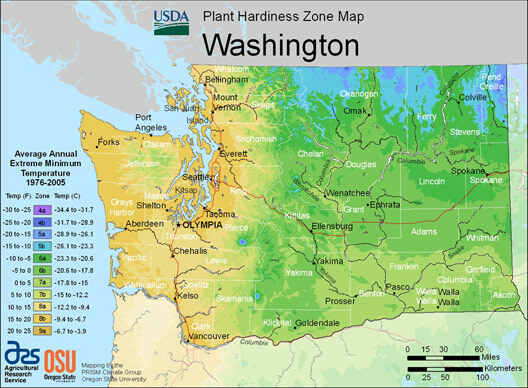 USDA Plant Hardiness Zone Map is the standard by which gardeners and growers can determine which plants are most likely to thrive at a location. Simply type in a ZIP Code and find the hardiness zone for the area of interest. Hortsense: Home garden fact sheets for managing plant problems with Integrated Pest Management (IPM). Pestsense: Fact sheets for managing common indoor pest problems with Integrated Pest Management or IPM. Plant and Insect Diagnostic Laboratory: The Washington State University Puyallup Plant & Diagnostic Laboratory is committed to helping the citizens of Washington State resolve their troubles with plants and insects through accurate diagnoses.